WASHINGTON, D.C. -- More Americans who own credit cards say they always pay the full amount of their credit card balance (48%) than did so in the years before the 2008-2009 Great Recession. The 33% of credit card holders who say they leave a balance each month is a record low since Gallup began measuring these habits periodically in 2001. 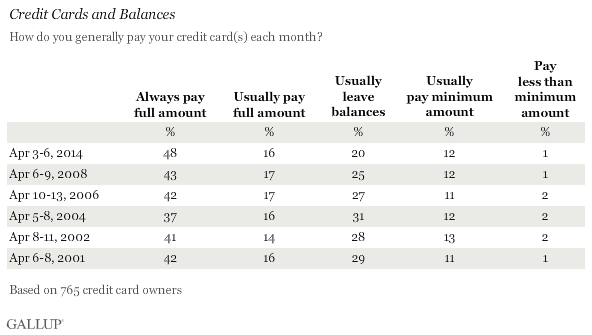 The 64% of Americans who always or usually pay the full amount of their credit card balance is the highest Gallup has recorded. These results suggest that American credit card owners are more fiscally responsible than they were in the 2000s when it comes to paying their credit card balance each month. The number of credit cards Americans say they own is, on average, lower than it has been since Gallup began asking about this segment of financial life. The 29% of Americans who do not own any credit cards is up from 22% in 2008. On the opposite end of the spectrum, those who say they have seven or more cards is at 7%. Overall, Americans have an average of 2.6 cards, including those who say they have no credit cards. For credit card owners, the average is 3.7 cards. The figure among all Americans is the lowest Gallup has recorded. Overall, Americans, including those who do not own a card, carry an average of $2,426 in credit card debt, more than $500 less than what they said in 2008, and the lowest Gallup has recorded. Among credit card owners, that balance is $3,573, down almost $300 from 2008 but about $150 higher than in 2006. This suggests that the amount of overall debt for credit card owners has not changed much compared with 2006, and the decline among all Americans is mainly because fewer Americans own credit cards. 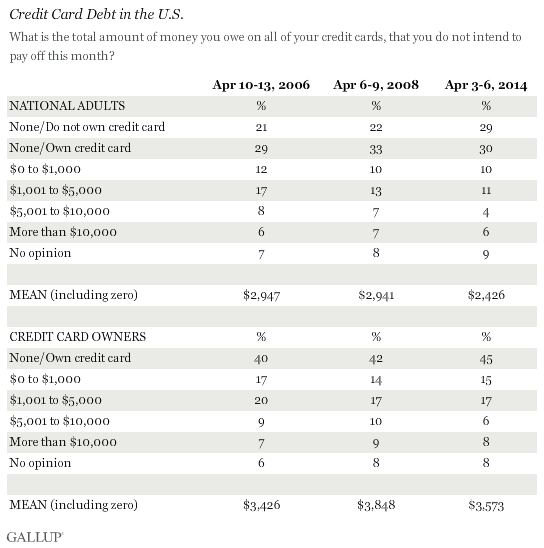 Americans are less reliant on credit cards than in the past. They are carrying less credit card debt overall, own fewer cards, and are more likely now to say they always or usually pay their full balances every month. This suggests that credit cards -- a staple of American consumer life for decades -- might not be as vital a financial tool to individuals as they had been in the 1990s and 2000s, when Americans often used their credit cards to make ends meet. As a result of the Great Recession, however, credit card companies raised interest rates for many cardholders, which may have altered Americans' spending and credit card habits. Additionally, it may be harder now for Americans to get approval for credit cards as banks and businesses impose stricter rules and lower credit limits. The credit card industry is still experiencing difficulties in expanding after the recession, as Americans pay off more of their balances. Also, people in the U.S. have shown they prefer saving more than spending in recent years, which may also account for the decline in their reliance on credit cards. Results for this Gallup poll are based on telephone interviews conducted April 3-6, 2014, with a random sample of 1,026 adults, aged 18 and older, living in all 50 U.S. states and the District of Columbia. For results based on the total sample of 765 credit card owners, the margin of sampling error is ±4 percentage points at the 95% confidence level. Americans' top financial concern is not having enough money for retirement, followed by unexpected medical costs and maintaining their standard of living. A majority of Americans have been worried about retirement savings since 2001. While most Americans prefer saving money to spending it, the tendency is strongest among those households making less than $20,000 per year. Younger adults and liberals are more likely than the general population to prefer spending their money. Americans' financial worry has eased to its lowest level since before the recession, based on responses to seven different personal financial items. Americans worry most about retirement and paying for serious medical issues.